I would like to begin by refusing to apologize for having been absent for almost a month. Cause you all know I'm not! Not sorry, that is. It's funny how I begin things (oh no, not just blog posts - I neglect MANY things that I start) and then never get around to finishing or continuing or completing or any of those fun words that mean I can actually do something from start to finish! In any event, I have been creating layouts - not at an alarming rate or anything, but enough to have a few in my back pocket that I'm hoping to churn out into a few posts. Yes, you heard me right. A couple posts. As in: MORE THEN ONE! As in: I'm going to write them all today and put them on future post. As in: Yeah, I'll set them to post daily for like three or four days in a row and then promptly forget I have a blog for another month! Yay! Here's a little something I cranked out this afternoon. My Aunt Glenda came for my Mom's Surprise 50th Birthday Party back in April (2012), and with her she brought a pile of old photos that had (basically) me in them! I've been slowly working my way through them, using them in layouts here and there, trying to use them up instead of dooming them to a life in an album or a box somewhere never to be seen. This particular photo has been our family picture for years. It's graced the walls of my parent's living room since it was taken. I am now 26 and I'm the little one holding the flower. So that's a long, long time people. Plus, I have a baby brother now too - he's totally not in this picture (obviously!) - so it's really time for Mama to get a new family photo. Anyway - back to the actual layout! Like I said, I'm the toddler holding the flower. I refused to look at the camera because I was too interested in the flower I had just savagely picked from my Nan's garden. Also - another interesting fact - my parents are wearing sweat pants! Who wears sweat pants to a family photo?! Haha. I know this because my Aunt was the photographer and the out-takes are kicking around somewhere! 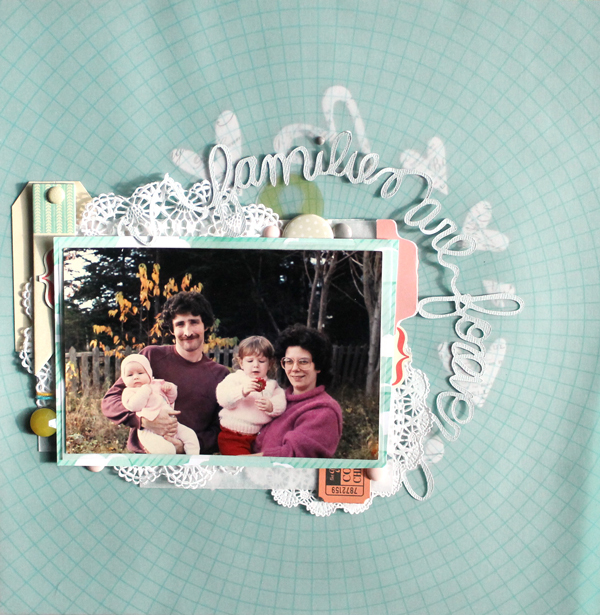 The title "Families are Forever" is from the Silhouette Store and cut on cardstock. Most of the elements are from the Studio Calico Kit Block Party and Add-on, Wildberry Court. I also received the Block Party Card kit, so there may be bits and pieces of that kit in here too. I never keep my kits separated if they belong to the same month. This layout was missing something though, so I ended up throwing in doilies procured from both Studio Calico and Treasured Memories. There are also about five glassine envelopes backing various elements that were purchased at TM. I've also thrown in a lot of little things that were sitting in bowls on my desk - die cuts, brads, etc.